Since 2008 a group of dedicated volunteers including veterans, local politicians, business owners, and citizens have given a gargantuan amount of time and money to restore the Lompoc Veterans Memorial Building. The 80-year-old building was in a state of disrepair, but thanks to hundreds of thousands of dollars raised, which put contractors and other laborers to work, the building is back in a beautiful way. Fulton Leroy Washington was at first only slated to paint one mural for the Lompoc Veterans Memorial Building Foundation, explained the organization’s secretary Frank Grube, but once they received the piece—a very detailed depiction of the flag raising at Iwo Jima—funding was allocated for additional works. But one person who volunteered his time and skills last year did so without ever seeing the building or stepping foot there. Fulton Leroy Washington was serving a life sentence at the U.S. Penitentiary at Lompoc and offered his skills as a painter to the Lompoc Veterans Memorial Building Foundation. Three of his murals hang there, which he created while incarcerated. On Oct. 23, representatives of Santa Barbara County 4th District Supervisor Peter Adam—who has an office at the memorial building—and the Santa Barbara County Office of Arts and Culture held a reception event at the Memorial Building honoring Washington. He was able to attend thanks to the executive pardon he received from President Barack Obama during May of this year, which took effect on Sept. 2. Washington told the Sun that the event enabled him to meet all the people who he believed helped give him a chance to stand out among the tens of thousands of applicants for the pardon. “I appreciate them more so than I could ever express or imagine,” Washington said. “To have my work in that building is really such an honor, and I’m grateful and really have a lot of gratitude. They applied for a national historic protection, which was granted, so now my artwork will be protected for the life of the United States with the building, and I will be in the history books as the person who created it. I was really touched by that. Fulton Leroy Washington, who goes by Wash or Mr. Wash, served 20 years in federal penitentiaries, including United States Penitentiary Lompoc. While there, he used his newfound painting talents to try and enrich the community around him, collaborating with the Lompoc Mural Society and the Lompoc Veterans Memorial Building Foundation on several projects. Washington was granted clemency by President Obama in July of this year. Washington was serving a “natural life sentence” at the Lompoc penitentiary. He was arrested and convicted of a drug manufacturing charge in 1996, a crime for which he’s maintained his innocence. During the appeals process, his lawyer had asked him to sketch the faces of the men he believed were the actual culprits of the crime, Washington explained, but the appeal was thrown out and he was given a “natural life” sentence, which means he was to be essentially incarcerated until his death. It was that moment, he said, having to draw to preserve his freedom, that rekindled his adolescent interest in art. 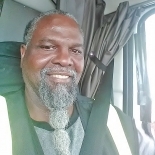 Even though he asserted that he was wrongfully convicted, Washington decided to dedicate his time in prison to creativity, positivity, and development of “a promise I made to God,” he said. That’s how he began painting too. He couldn’t afford the painting classes at the prison in Leavenworth, Kansas, where he was initially sent, but traded a sketch for some leftover paints a fellow inmate had. He began teaching himself how to blend and paint over his sketches with the limited colors available. As the years went on his skills developed and refined to the point where Washington was leading classes as a teacher. 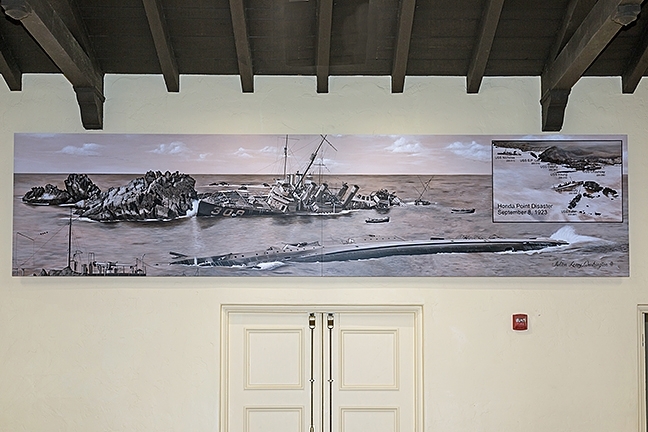 The largest piece at the Lompoc Veterans Memorial Building by Washington depicts the Honda Point Disaster of 1923, the largest peacetime loss of Navy ships in U.S. history. Washington was later transferred to the Lompoc penitentiary where he was approached to do work for the Lompoc Veterans Memorial Building Foundation. He offered several large murals to be painted at the prison, but the foundation could manage to fund supplies for only one piece, explained the organization’s treasurer Frank Grube. Once an agreement was reached, Washington received the paints and supplies and got to work on the mural, Grube said. Once the first mural was brought to the building and unveiled to the foundation, everyone was stunned by the photorealistic detail, Grube said. Funds were immediately allocated for two more works. 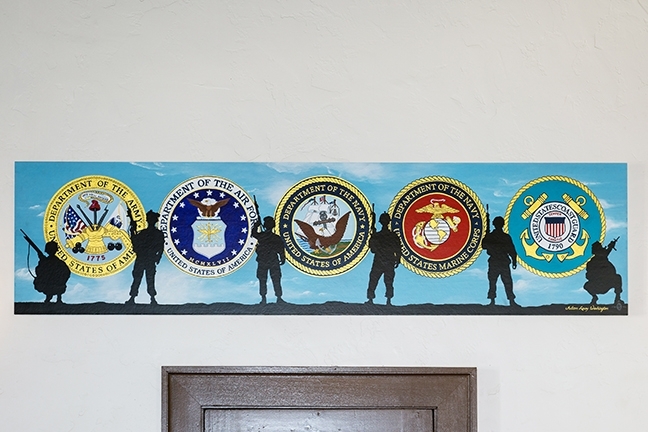 One is a 2-foot-by-8-foot painting of the seals of the five branches of the U.S. military and the silhouettes of soldiers. And then there’s “the big one,” according to Grube, a 4-foot-by-16-foot depiction of the Honda Point Naval disaster, which occurred just off the coast of Lompoc in 1923. 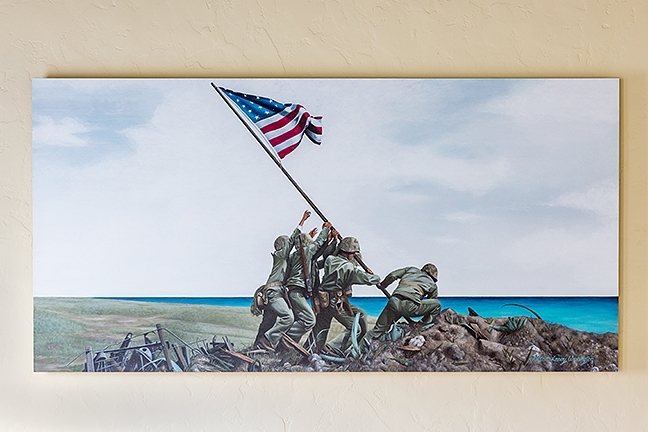 Washington completed three murals for the Lompoc Veterans Memorial Building Foundation in 2015 while incarcerated at United States Penitentiary Lompoc. 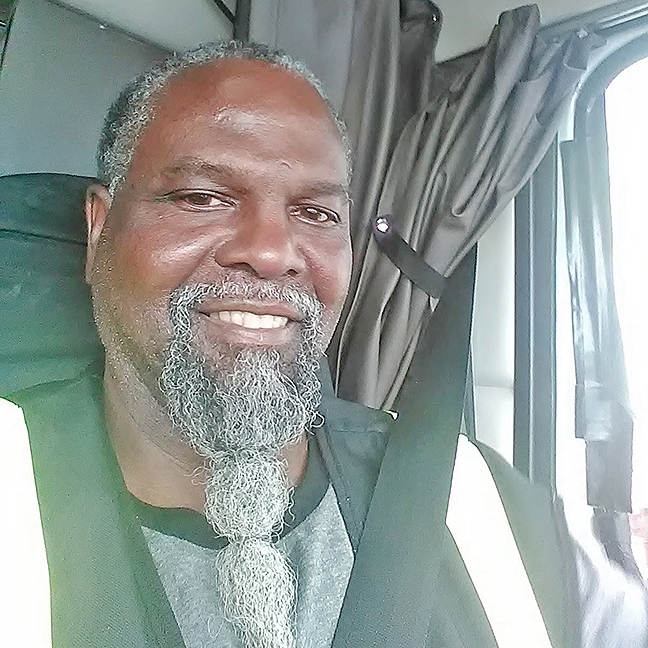 He believes the community service he rendered was a big influence in the executive clemency order from President Obama that set him free in September of this year. The people involved with the Lompoc Veterans Memorial Building are quite diverse, Grube said. There are veterans, of course, but there are also local politicians including county supervisors and former Lompoc mayor John Linn. 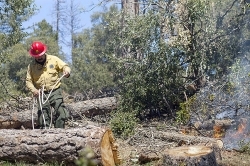 There are also locals who remain dedicated to the foundation despite involvement with other organizations, like foundation chair Alice Milligan, who is a retired school district administrator and is also the president of the Lompoc Hospital Foundation and remains involved with several other organizations as well. Everyone dedicated to the foundation volunteers their time, Grube explained, so what Washington did was right in line with their vision and dedication, he just had to help from behind bars. People from the Lompoc Veterans Memorial Building Foundation weren’t the only ones who wrote letters for Washington, Grube explained. Members of the Lompoc Mural Society wrote letters for him after his contribution to a community canvas project. Other individuals who appreciated his work also wrote letters directly to the White House after Washington applied for the pardon. The Lompoc Veterans Memorial Building is open for visitors on Wednesdays from 8 a.m. to 5 p.m. and also by appointment. The building is located at 100 E. Locust, Lompoc. More info: 717-3022 or donaldramirez688@yahoo.com. The details of his case and time spent incarcerated already qualified him for the strictures of the program, Washington explained. The offense he was convicted of was non-violent, which covered one criteria, and he never committed any violent crimes once in prison, another criteria for inclusion. But Washington was only one of more than 36,000 people who applied for the clemency program, he said, and so he believes that his art and the support he received from the community were essential in his pardon. “In one sense you could say I painted myself out of prison,” he said. “There were eight criteria that I had to pass through, but I honestly believe it was the artwork and the painting that captured the attention of the people reviewing the files. Arts Editor Joe Payne felt privileged for the chance to speak with Fulton Leroy Washington. Contact him at jpayne@santamariasun.com.